The Tomorrowland Speedway is the only attraction remaining in Tomorrowland from the Magic Kingdom's opening day in 1971. I've had hundreds of tour guests ride it, but I saw something last week that I had never seen before. 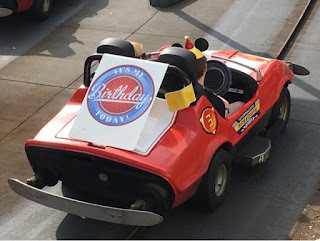 One of my guests was celebrating his birthday, and a cast member attached this large placard to the back of his car.